It is 5 p.m. at Hillcrest retirement home in La Verne, and the residents are filing in for their homemade gourmet dinner. The smell of cream of cauliflower, garlic-herbed meatloaf and sautéed mushrooms fill the open dining room, and the sound of a busy kitchen hums in the background. The residents serve themselves helpings of delicious food and find their way to a beautifully set table. By 6 p.m., the dining room is completely full and buzzing with chit-chat among residents. One man, however, stands out in his long-sleeved white shirt and larger white hat. He slowly makes his way from table to table, talking to each person and engaging in conversation. He smiles and hugs many of the residents like they are old friends. “Do you like the meatloaf?” he asks. “How is the cauliflower? Any suggestions for next time? How is your family, Sue?” The man in the white hat is French chef Christian Laire, who has brought more than 25 years of culinary experience to Hillcrest. Christian’s first experience with cooking came at age 12. He was watching over his two brothers after school while his mother and father were stuck with car troubles in their little town of Lyon, France. Usually his mother would prepare dinner for the hungry children in the house, but Christian knew that dinner would not cook itself that night. He knew how to prepare a basic dish because he had watched his mother do it many times before. He took out a sauté pan and began searing fresh peas for his siblings. When his mother came home she was surprised when she tasted the peas. “Wow, these are really good. You should be a chef,” she told him. Eventually he opened up his own hotel, bar and restaurant, called La Residence, in his hometown of Lyon, where he served up his favorite French dishes. “It was a beautiful place, and it was my own. I got to make up my own French dishes using my favorite herbs,” Christian says as he spins a tea bag into hot water in the now empty Hillcrest dining room. Christian eventually moved on, cooking in French cities such as Alsace, Geniva and Mon te Limar. He was then hired as a chef at the four-star restaurant inside the prestigious Le Hotel De Paris, where they used delicacies such as fois gras and only prime cuts of meat. Every dish was cooked to order. After a stint in Switzerland, Christian moved to the U.S., and settled in California. “I don’t know why I moved here exactly. Sometimes I ask myself why I did it too,” he laughs. “But I like it here, and I regret nothing.” Christian first worked at the French restaurant Le Chêne in Santa Clarita for 12 years, and then opened his own restaurant in Montclair, Calif. called Opinel. When rent costs got too high, Christian decided to close Opinel, and worked as a chef in other restaurants around California while he studied nutrition. Then in 2007, he interviewed at Hillcrest retirement home. “I needed a job, and I was actually offered other jobs at the time, but I chose Hillcrest. My gut told me to come here. I knew it was the right fit for me,” he says. Christian starts work around 6 a.m. each morning, preparing Hillcrest’s three kitchens for the daily meals. Everyday, he walks through the bustling kitchen, giving his staff directions and advice. “Make sure to test that, it may have too much salt,” he says. 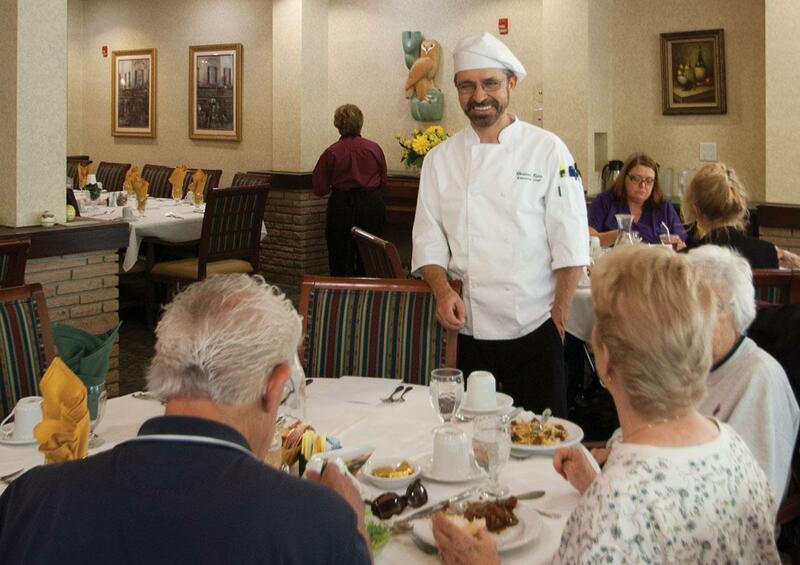 Although he does not cook every day, he is the voice behind every dish prepared at Hillcrest. Christian trains all the cooks to constantly taste test and make sure every dish is perfect, because in his mind, every person at Hillcrest deserves the perfect bite. He also uses fresh and local ingredients to prepare the meals at Hillcrest and has introduced many of the residents to French food. Christian loves to incorporate his favorite seasonings and ingredients into the meals. He believes that every spice benefits health, so he has taught his staff to use herbs de provence, basil, rosemary and even Indian seasonings like garam masala. His favorite dish to make for the residents is a sautéed fresh white fish with his famous bourgeois sauce, made with wine, cream and shallots. Christian plans events for the residents as well, such as “Cooking with Christian” to encourage healthy and delicious eating that the residents can cook themselves since many of them live independently on the Hillcrest grounds, with their own kitchens. He also organizes the event “Passport to Food,” where he introduces residents to different international cuisines each month. In March residents explored Irish food for St. Patrick’s Day. Each month features a different dish for a different country, and the residents receive a stamp in their own personal food passports each time they participate. At the end of eight months, the residents put their passports into a drawing, and the first seven chosen receive a private meal prepared by Christian. Mix brown sugar with half the amount of vinegar, cook and let caramelize to dark brown, then add remaining vinegar, wine, orange juice and zest, bay leaves, cranberry jelly and juice, and bring to boil for 10-15 minutes. Add the cornstarch mixture. Blend the mixture until smooth and bring back to a boil before serving.